Report about the new Ambient Assisted Living strategy of the ISNM. LÃ¼becker Nachrichten. Documentary about the LiveMusicPortal project, LÃ¼beck Art TV. 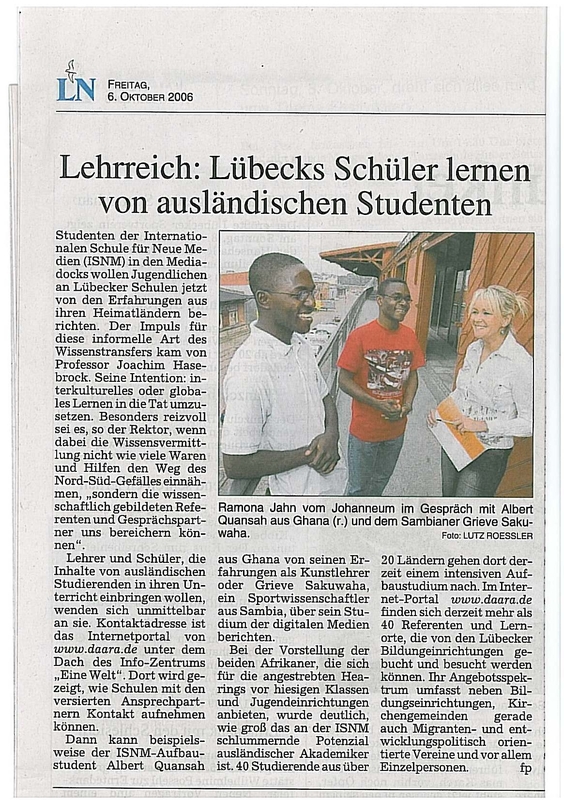 Report about the HolstenTour project, LÃ¼becker Nachrichten. Leaflet "Netzwerke eRegion 2007" of the Ministry for Science, Business and Transport in Schleswig-Holstein. Report about the PICTORY project and the ISNM. LÃ¼becker Nachrichten. Report about the LiveMusicPortal project. LÃ¼becker Nachrichten. Report about the Daara Project. LÃ¼becker Nachrichten. 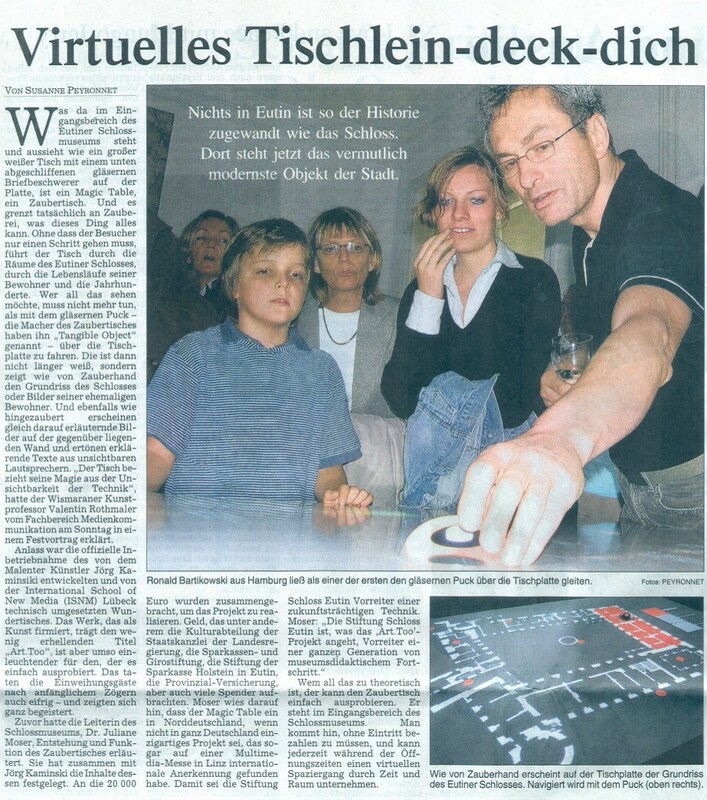 Report about the Magic Table project at Eutin Castle Museum. 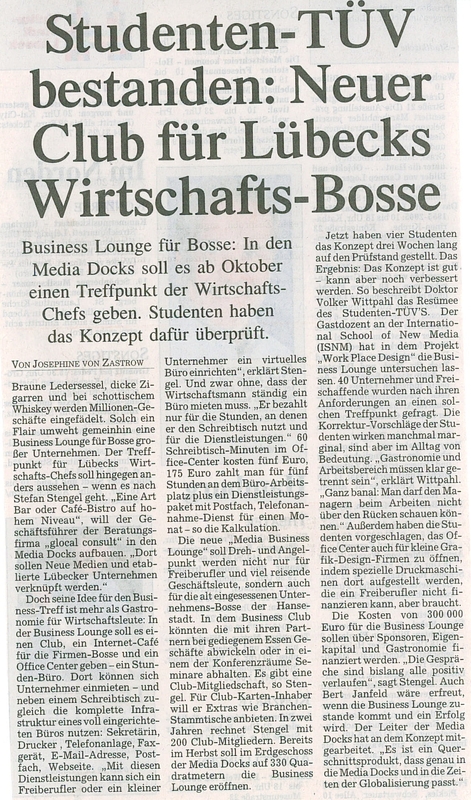 Ostholsteiner Anzeiger. Report about the Magic Table project at Eutin Castle Museum. LÃ¼becker Nachrichten. 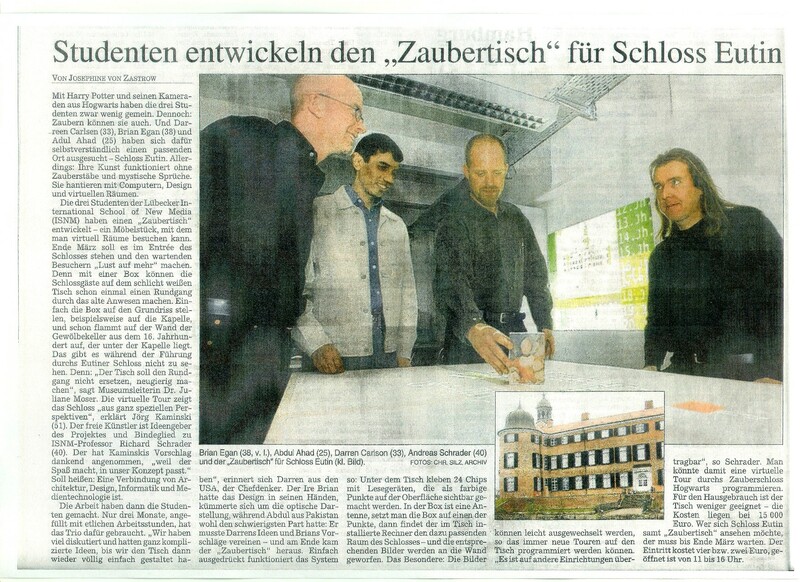 Report about the Magic Table project at Eutin Castle Museum. Kieler Nachrichten. Report about the ISNM in: BjÃ¶rn Engholm (Ed. ): Zukunft Hanse. Wertorientierung einer Stadt im Aufbruch. Schmidt-RÃ¶mhild, p. 68-69. 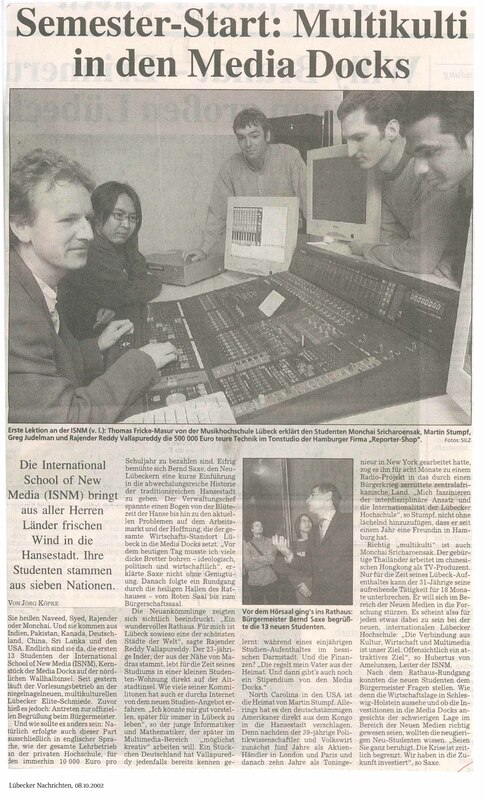 Report about the ISNM OpenHouse 2006. LÃ¼becker Nachrichten. 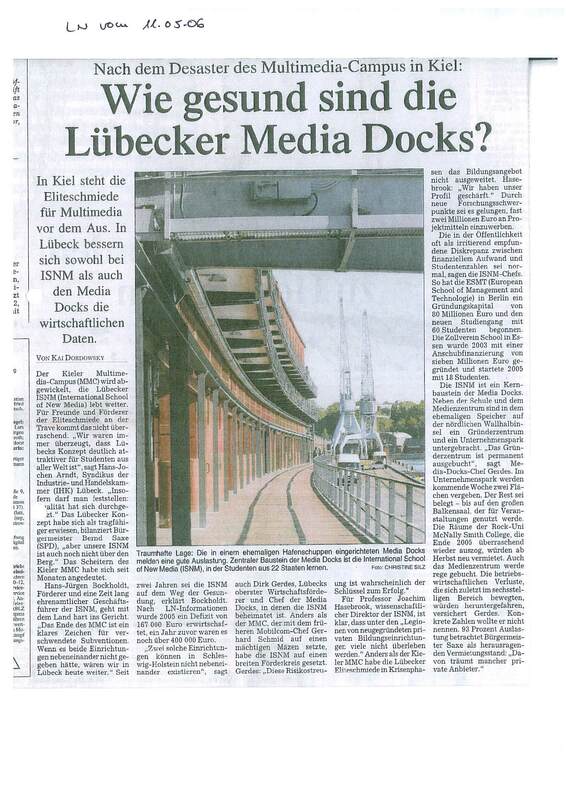 Wie gesund sind die LÃ¼becker Media Docks? 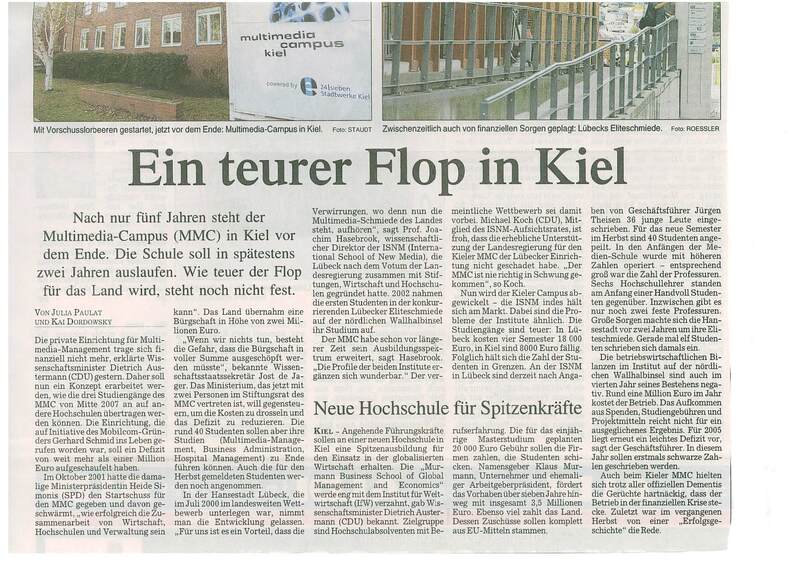 Report about the ISNM and the Media Docks after the crash of the MMC in Kiel. LÃ¼becker Nachrichten. Report about the structure of private educational institutes in Schleswig-Holstein. LÃ¼becker Nachrichten. Report about the BaSoTi Summer School in Vlinius, September 2005. LÃ¼becker Nachrichten. 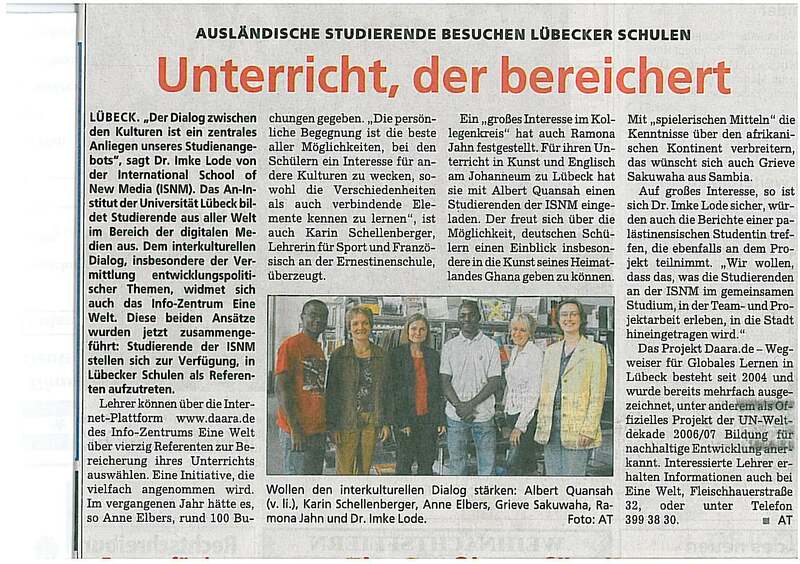 Announcement of the Intercultural Communication Workshop "Toleranz Lernen", July 22nd 2005. LÃ¼becker Nachrichten. 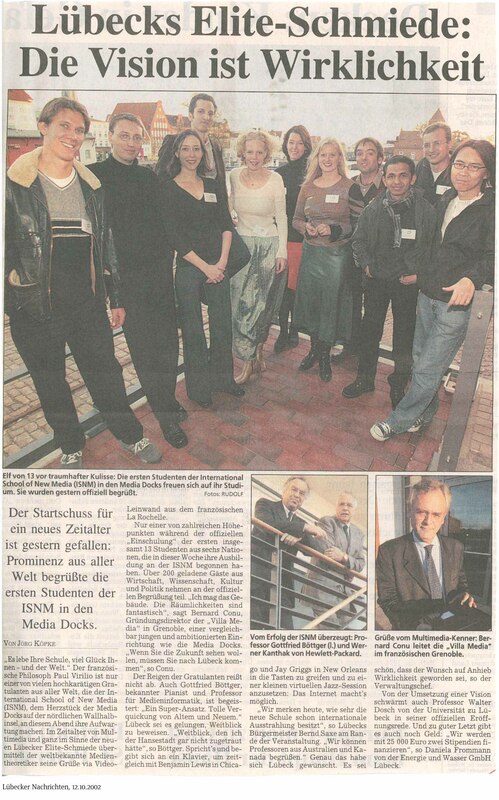 Report from the ISNM OpenHouse 2005. Interview, Campus Radio LÃ¼beck. Report about the Graduation 2005. LÃ¼becker Nachrichten. Trailer for the ISNM OpenHouse 2005. Interview, Campus Radio LÃ¼beck. Report about the library project of the ISNM. Interview, Campus Radio LÃ¼beck. 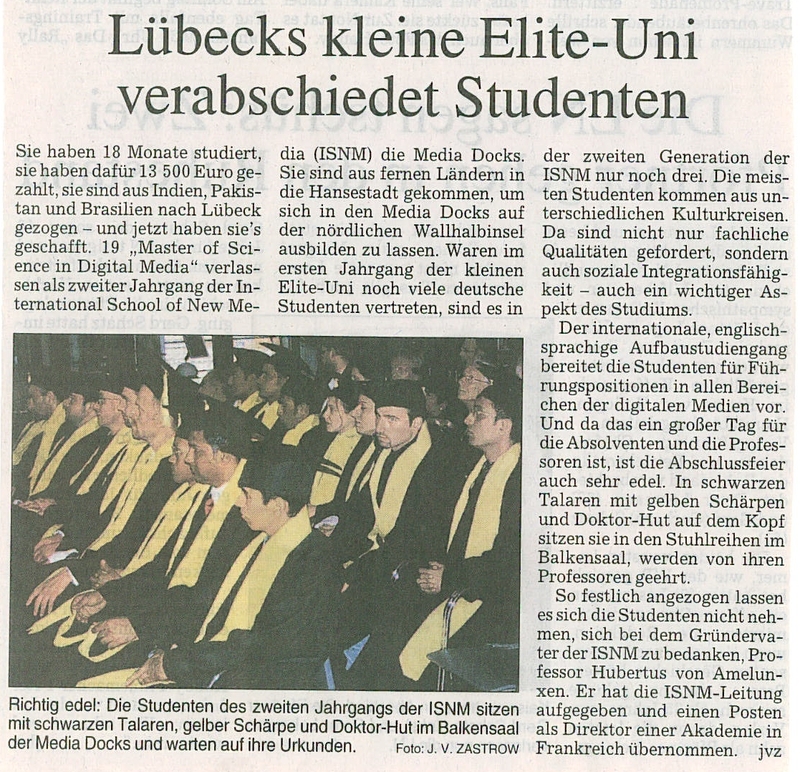 Report about the ISNM and the Master of Science in Digital Media. Frankfurter Allgemeine Zeitung. Report about the start of the second semester. LÃ¼becker Nachrichten. 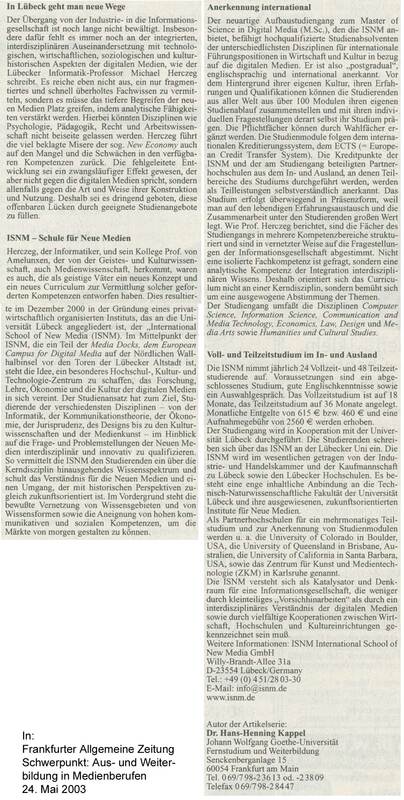 Report about the ISNM. Financial Times Deutschland. 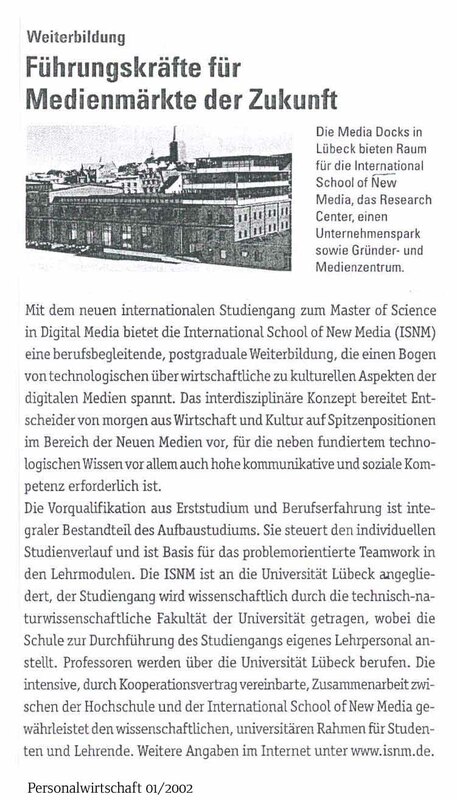 Information about the ISNM and the Master of Science in Digital Media. Allegra Women & Work. Report about the welcome of student generation 2003. LÃ¼becker Nachrichten. 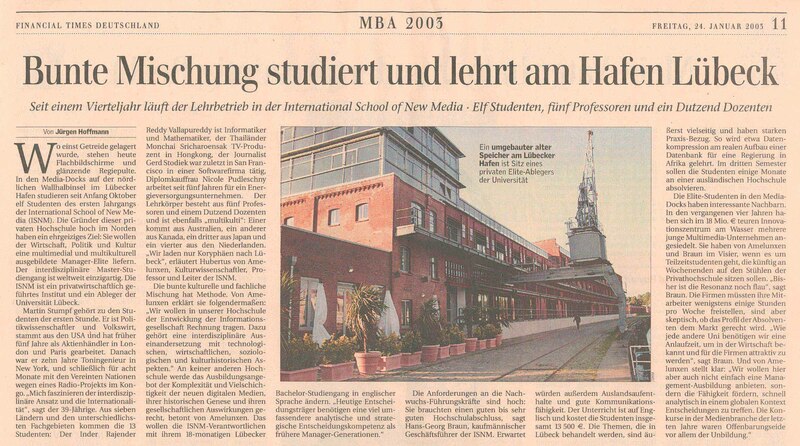 Report about the start of the Master of Science in Digital Media. Dittmarscher Landeszeitung. 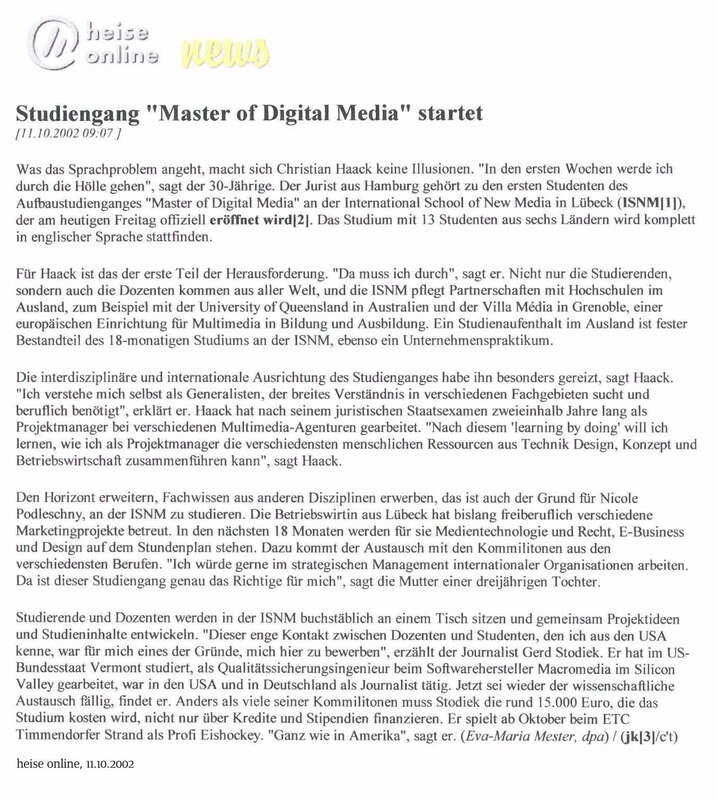 Report about the start of the Master of Science in Digital Media. heise online. 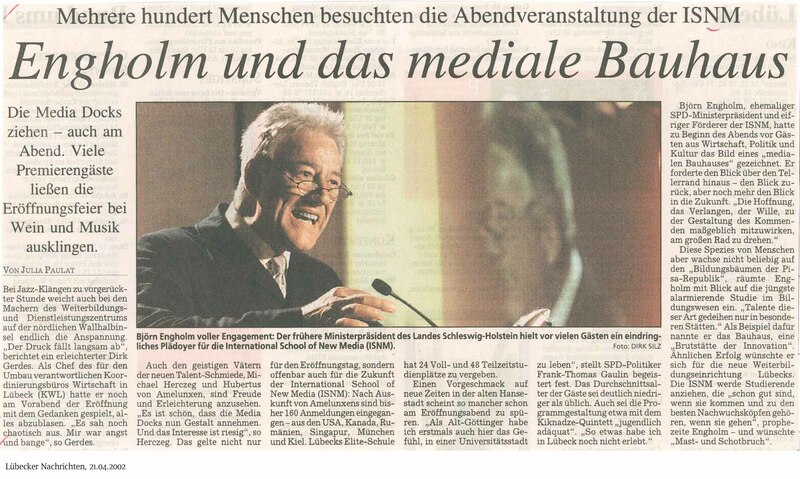 Report about the start of the Master of Science in Digital Media. LÃ¼becker Nachrichten. 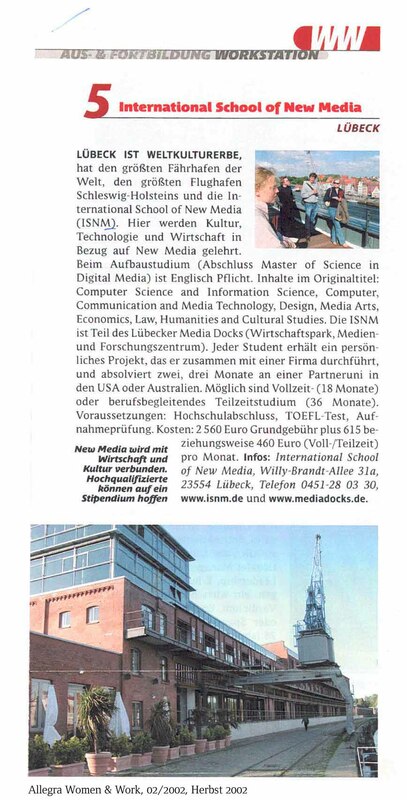 Report about the start of the Master of Science in Digital Media. die tageszeitung (taz) Hamburg. 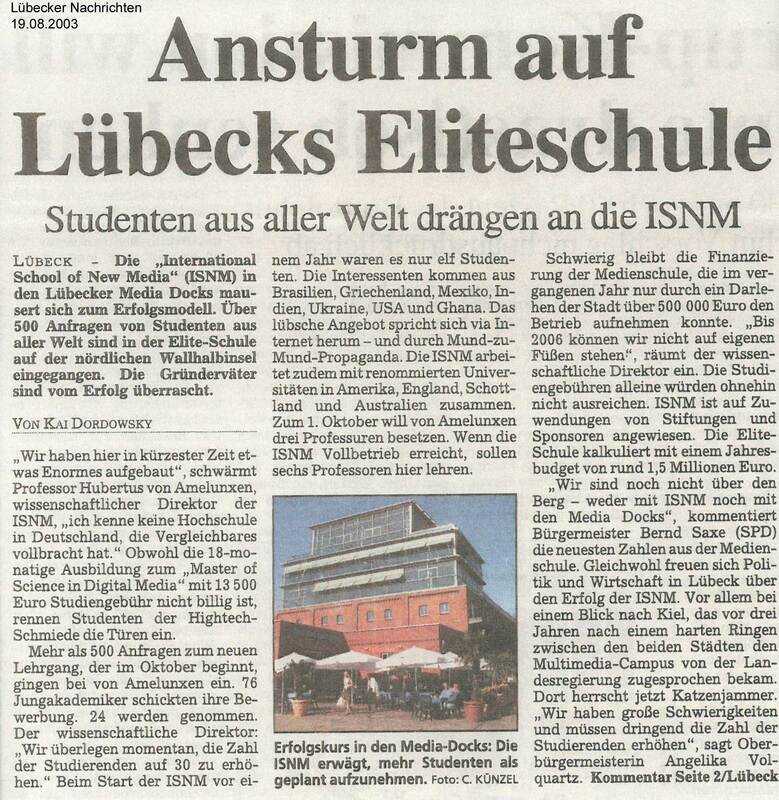 Report about the Opening Party of the ISNM. LÃ¼becker Nachrichten. 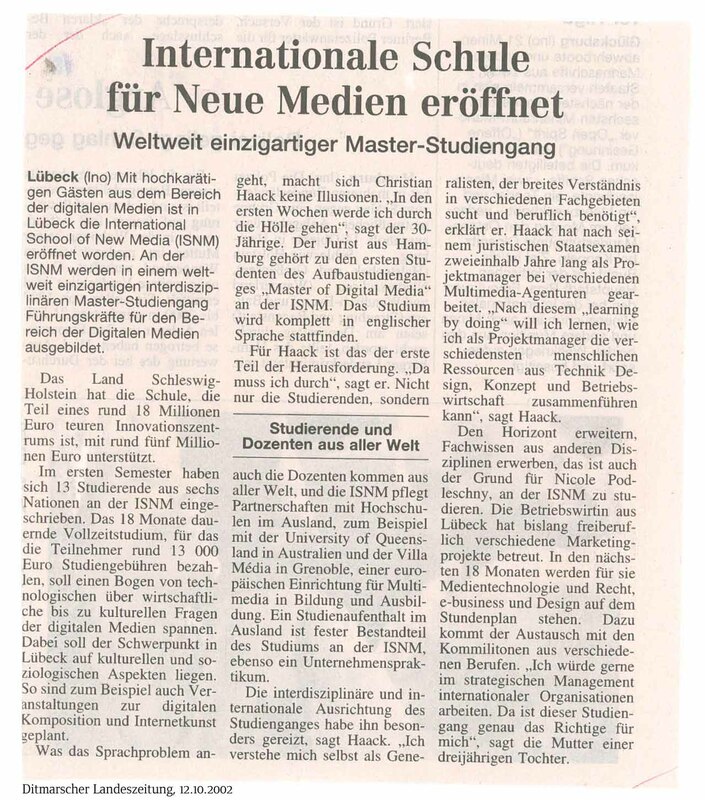 Report about the ISNM and the Master of Science in Digital Media. UNI piste magazine. 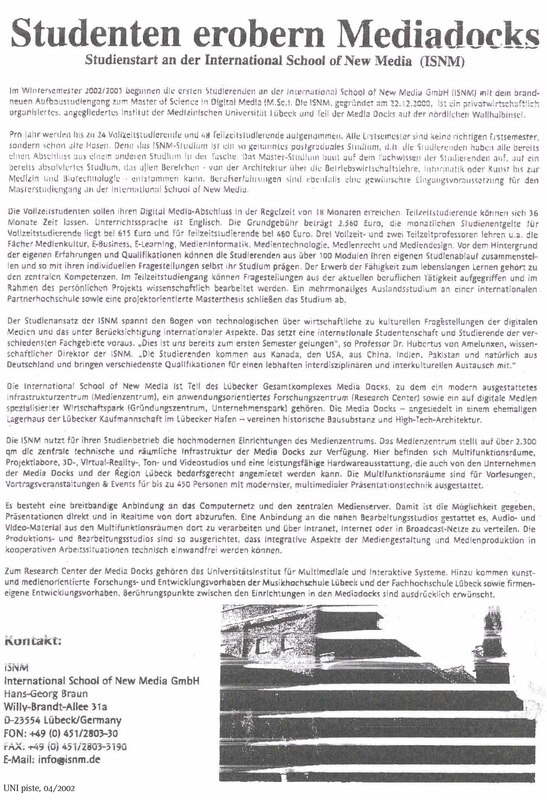 Report about the planned Master of Science in Digital Media. LÃ¼becker Nachrichten. 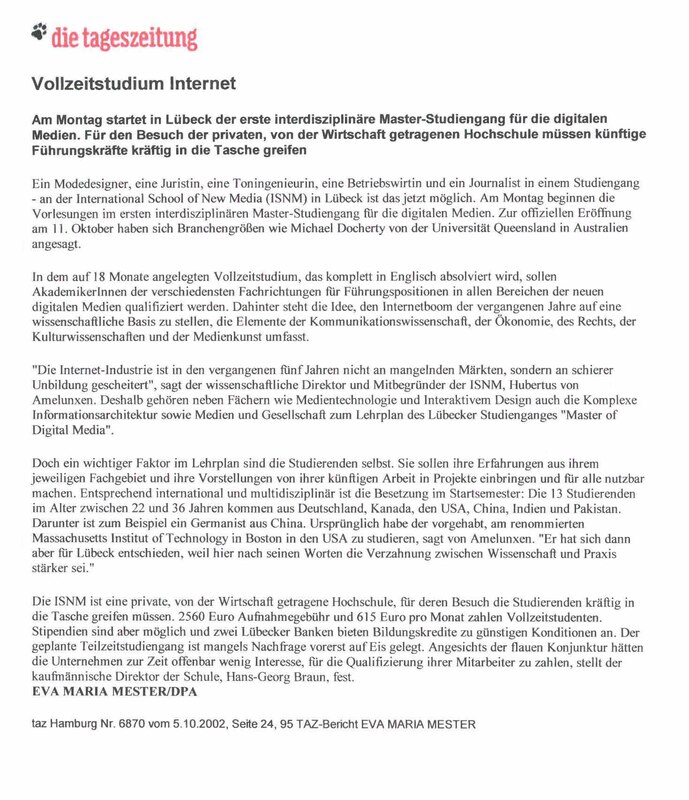 Report about the ISNM and the Master of Science in Digital Media. Personalwirtschaft.